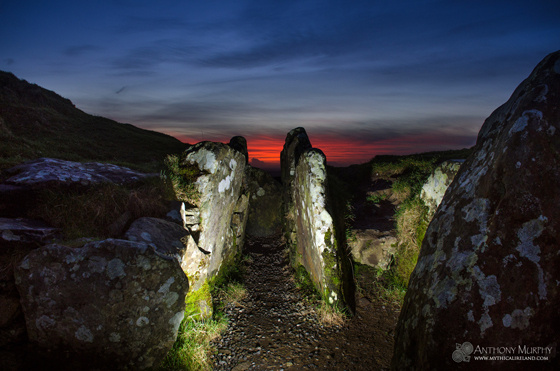 The passage of Cairn U in the pre-dawn sky of February 3rd. I was unaware of any photographic proof extent showing the sun aligning with the passage of Cairn U. 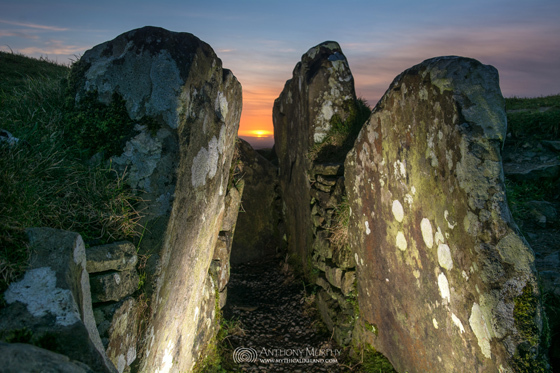 Probably the best-known photographer of ancient megalithic sites and their alignments is Ken Williams of Shadows & Stone. In personal communications, Ken indicated to me that although he had been at Cairn U around the time of the cross-quarter sunrises, and although he had some photos, he hadn't been there on the exact day. 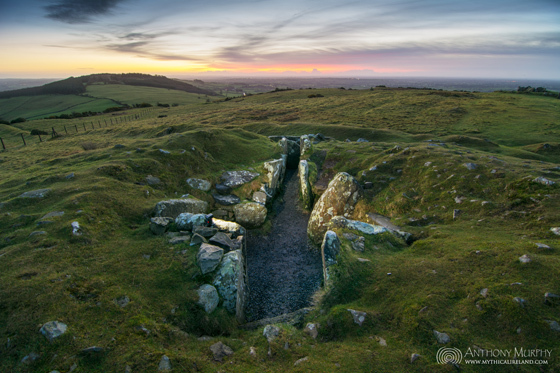 I set out from Drogheda at 6.25am with the intention of getting to Loughcrew (which can take an hour or so by road) and climbing up the hill to be ready for sunrise, which occurs at around 8.08am. With all the camera gear, the walk up the hill is quite laborious! Cairn U looking down the passage from the end recess towards the southeastern sky. With a red sky forming because of some cloud towards the southeast, it was clear that the sun would come up in the approximate direction to which the passage of Cairn U was pointing, with me positioned in the rear recess (photo above). The sun was obscured by cloud for the first few minutes after the actual moment of sunrise. So I was unable to make direct observation at the moment the sun was rising above the horizon. However, what was immediately clear was that the sun's position was still somewhat to the south of where it needed to be for a direct alignment. I observed the sun's azimuthal position from the light that it was projecting on to the clouds. Crouched in the rear recess, I couldn't see the sun or its light. However, on leaning slightly into the left-hand recess, I could see the sun coming out from behind the clouds in alignment with the passage. This is shown in the photo below. It was a great thrill to see the sun emerging though. I suspect it will be maybe a week or so before the sun is rising directly in alignment to the rear of the end recess - but unfortunately this is just a rough guess and there is no empirical method to my guesstimate! Perhaps a return visit next week might be in order. A closer view of the sun's appearance from the interior of Cairn U. The alignment today was such that I had to lean towards the left-hand recess of Cairn U in order to see the sun through the passageway. Perhaps the cairn focuses on a range of sunrises, maybe lasting a couple of weeks. This is something that requires further observation. Megalithic art on the side stone of the left-hand recess of Cairn U. About 15 minutes after sunrise. 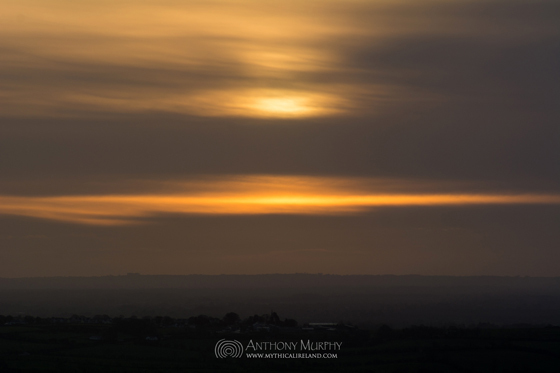 The Hill of Tara is located at the clump of trees towards the left. It's such a great pleasure to be able to observe these astronomical occurrences at prehistoric buildings. There are numinous qualities to such moments because they transcend temporal boundaries and take us back, in a way that is both spiritually and empirically connective, to a remote era when our early ancestors observed heavenly phenomena. We can only conjecture at a possible greater purpose behind such alignments, and inevitably such conjecture takes us into realms that are both scientific and spiritual. On the one hand, early people were marking out the distinct patterns of the sky, making the ancient passage-tombs of Ireland primordial sundials (and doubtlessly moondials too). But their construction was such that they are a statement, tacit or explicit, of permanence, of longevity, in a world where the cycles of nature spun all too fast, especially where humans themselves are concerned. In the Neolithic, a great many people would not live to see even one completion of what was known in later Irish as the Naoidheachda, meaning "the nineteenth" - the 19-year cycle of the moon which today is known as the Metonic Cycle. The best a neolithic cairn builder could hope for was to see two complete Metonic Cycles. There were no elders in the New Stone Age, certainly not in the sense that we have elders today. Spiritual elders, perhaps, but not aged octogenarians or centenarians. At 40, you were a wise elder of the Neolithic community. At 50, you might have been seen as a freak of nature. Furthermore, the ancient passage-cairns weave a connective web suggestive of awareness or consciousness of a greater cosmos, in which the sun and astral bodies are not so much seen as things that are "out there", totally beyond reach or influence, but rather things with which humans and the animate world have a distinct interaction. 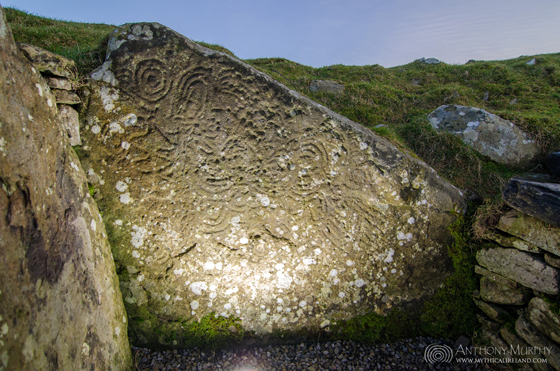 The light and heat of the sun can be seen to directly influence growth and seasonal patterns in nature, in addition to the many migratory patterns which would have been observable in the vicinity of the Boyne and Slieve na Calliagh tombs in the Neolithic. The moon's distinct and powerful effect on the tides is something that Alexander Thom remarked might have been known since time immemorial. The labour involved in creating cairns on hilltops must not be underestimated. Even a fit young person finds the climb to the summit of Slieve na Calliagh an exertive and physically demanding activity. Imagine repeating this exertion, with the additional burden of carrying a boulder, or several boulders. When one factors weather and the lack of any significant capable engineering or construction technology into the equation, the building of the cairns on the hills of Loughcrew seems a gargantuan task. These structures certainly deserve to be described as immense and monumental. As well as being prodigious feats of construction, they are monumental memorials to the humans who laboured hard to complete them. Their fastidious observations of discernible natural phenomena were ingeniously combined with an imaginative vista which opened towards realms that were supernatural, transcendental and otherworldy while retaining a physical connection to the telluric, sublunary sphere. 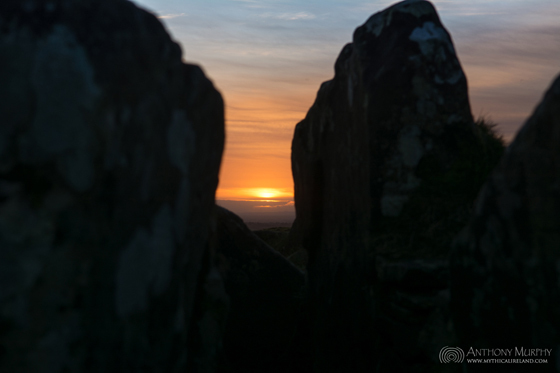 At Loughcrew, this world and the next are seen to coalesce. Up there, on the hills of the hag, one gets a sense of detachment from the ordinary mortal dimension. Reaching out towards the sky above and the horizon beyond, the young humans who had just discovered agriculture and who were setting in place the foundations of civilisation, stepped out through the inter-dimensional threshold of the cairns into whatever realms of the spirit or imagination lay beyond. There is yet at least one place on the earth where the ancient spirit dwells. When the fast-revolving clock of astronomical circuits ticks down on each of us at our own appointed time, we might aspire to those realms that were so anciently envisioned. Can we yet countenance the possibility that we will perhaps some day meet those who left their bones behind in the cairns of Loughcrew, out there, beyond that threshold?